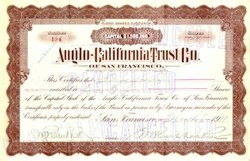 Beautifully engraved Certificate from the famous Anglo - California Trust Company issued in 1911. This historic document has an ornate border and is hand signed by by the company's president. This items is over 99 years old. Stamped cancelled.